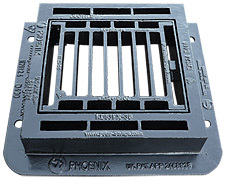 The Phoenix™ Gully Grating helps reduce roadside theft, replacement costs and associated claims. The average cost for a Local Authority to replace a standard grating is approximately £300-£350, this excludes the cost of any traffic management which could raise the cost to circa £1500-£2000 and would result in traffic disruption. The Peter Savage Limited patented Phoenix™ Grate has an integral renewable Phoenix cassette grating which if stolen can easily be replaced. Furthermore if the Phoenix cassette is stolen the reduced aperture compared with a standard grating means less chance of vehicle damage and associated claims. Phoenix™ Cassette replacement time approx 15 minutes compared with 2-3 hours for standard grating replacements. Integral grating is secured with captive hinges and a discreet spring-bar lock.